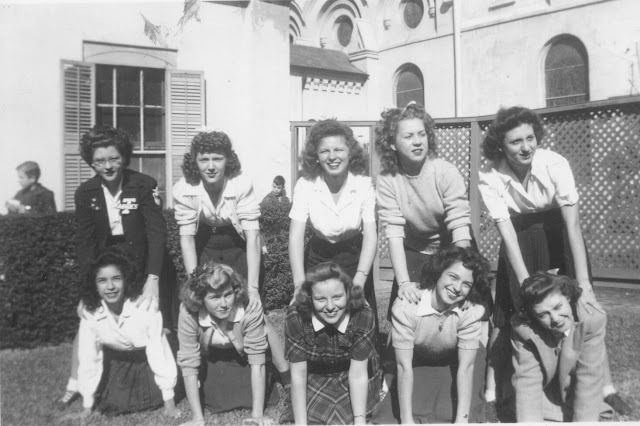 Top row, left to right: Dorothy Jean Gorman Kerkman Bickers (1928-2011), Marjorie Ann Hays Olson (1928-2011), Geraldine Margaret Guokas Pape, Dorothy Rose Rush Johns (born 1928), and Rosalie Marian Triola Zenner (born 1926). Bottom row, left to right: Vera Hope Barbosa Stowell, Shirley Patricia Hogan O'Brien (born 1928), Catherine Emma Holderman Williamson Dobecka (1927-2010), Miriam Catherine Jamail Perkins (1927-2004), and Katherine (or Catherine or Kathryn) Stringer. Interestingly, Mom's classmate Vera Barbosa Stowell has a daughter named Cindy who was my classmate at St. Agnes Academy in Houston.